The main reason tourists flock to Rotorua is to experience the otherworldly nature of the reality of this world. Here in Rotorua one can glimpse the inhospitable forces that lie under our feet, the monster that lurks under the bed. Remember me telling you that Auckland was built on top of 50 old volcanoes? There are a bunch of volcanoes in NZ, picturesquely so, like a Mt. Fuji look-alike (Mt. Egmont) here on the North Island (it’s off to the side and we’ll visit it another day). 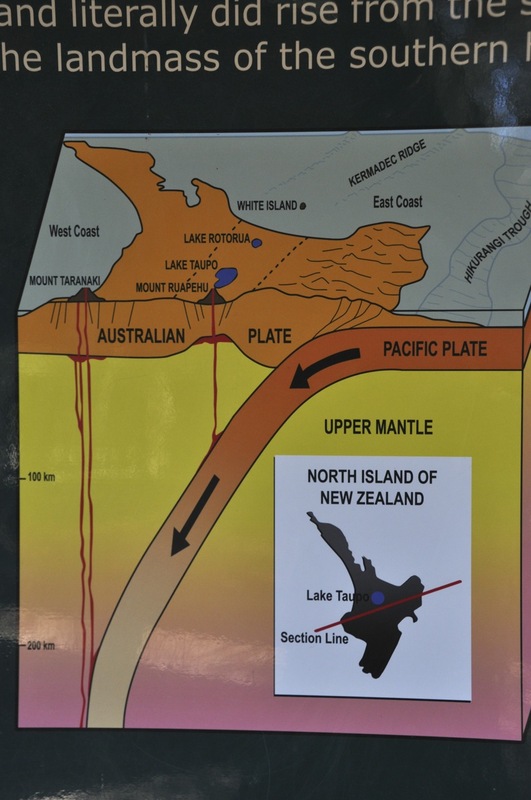 Rotorua is near the middle where a band of tectonic plate intersections cross the island. The world has been impacted by this region in the past; the picture on the left below shows NZ’s largest lake, Lake Taupo, which is over 350 square miles in size and was once a volcano. When it blew in 186 AD, it released more ash and debris than Krakatoa and Mt. St. Helens combined – and then multiplied by ten (!!). The Chinese noted a blackening of the sky, and the Romans recorded that the heavens turned blood-red. Need I point out that neither of those countries is even remotely close to NZ? The picture on the right shows one of the 3 nearby remaining volcanoes (located in the area used for filming Mordor and Mount Doom in Lord of the Rings) that is visible from Lake Taupo. 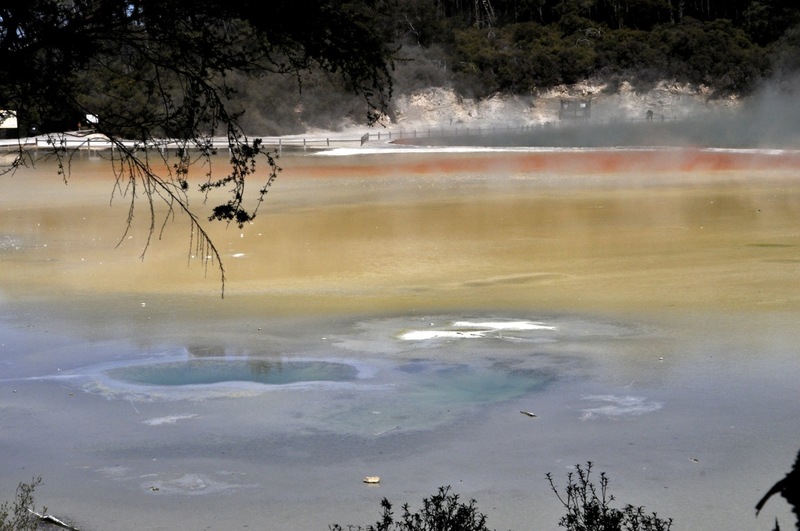 Rotorua is special because it is the world’s most concentrated and accessible geothermal area. Part of “world’s most concentrated” label means there are plenty of geothermal hot spots to visit around Rotorua, most with entry fees. And of course the place abounds with spas and natural hot pools at different temperatures (do you want to emerge pink, vermillion or crimson? ), along with historic Priest pools (cures arthritis and rheumatism), private rock-lined romantic pools with champagne and lake view, or Rotorua hot mud treatments, etc etc etc. Think tourism and lots of dollars! (Side note: New Zealand in general is very very good at offering viable enticements to separate you from your money). 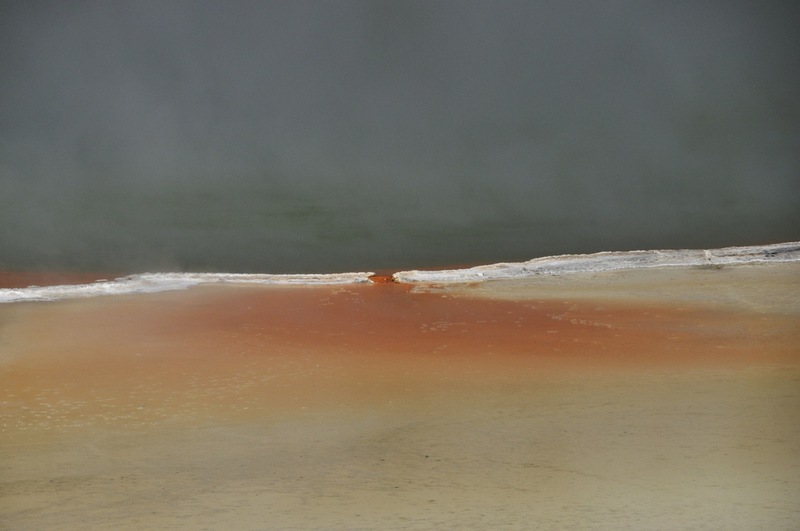 We opt to see some geysers at Te Puia (of the last post) and a colorful area called Wai-O-Tapu. Below are the Te Puia geysers. Unlike Yellowstone’s Old Faithful, these guys go off frequently and stay going for 45 minutes or so, so they’re mostly “on”. Wai-O-Tapu is fascinating, and very colorful. 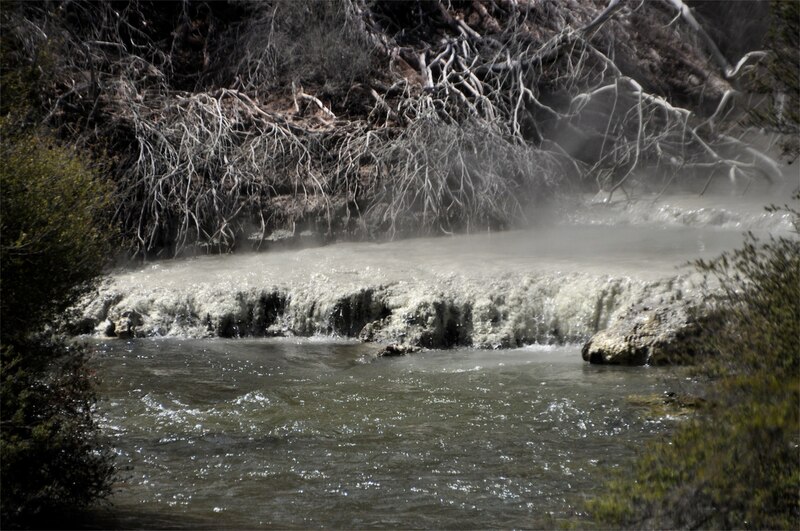 There are many fumaroles (holes that emit steam and mineral-laden gases), bubbling ponds or puddles blissfully simmering away, mud pools farting blobs that audibly plop back down, strange-colored pools, whitish solid silica flows, etc. Signs tell us the colors of the ponds are due to the metal chemicals that boil up in them – that blue means chloride (must be funny chlorides; not part of my analytical chemistry course), orange means antimony and arsenic, gray/chocolate means sulfur and carbon, yellow/green means sulfate, and green/yellow means sulfur and arsenic, etc. Let’s start by looking at the bubbling mud pools making disgusting sounds. The amount of rain determines mud consistency and therefore surface patterns; pictures at the site show interesting circular, concentric designs on the smoking surface. Alas, we’ve had a lot of rain and the surface is less texturally interesting, but the flying ploops are fun to watch. are good not only because the holes are deep but because we see small pools of boiling fluid near our feet that by extrapolation must lurk in bigger quantities troll-like at the bottom of these daddy holes. I’ll just stay on the path, thank you. 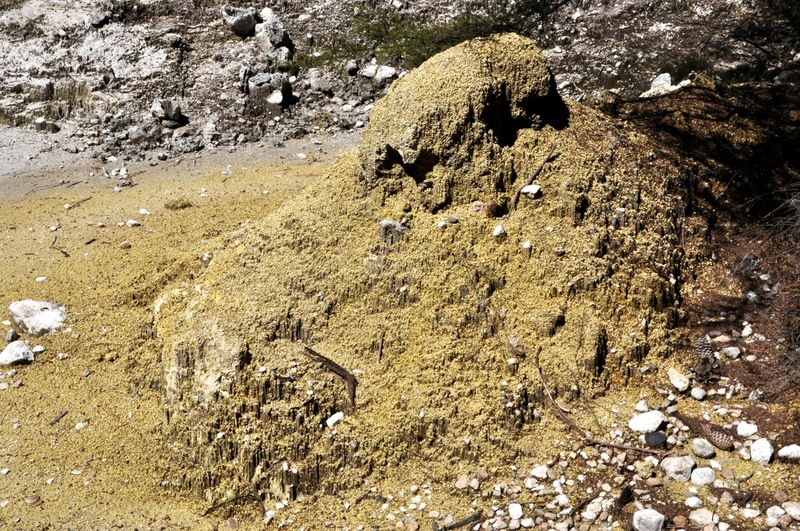 Sulfur is a frequent component of the released vapor, and it plates out as crystals on the pit walls, as shown. The image on the left has more color than just yellow, so the emitted gas must be pretty complex. Earthquakes sometimes tilt this region to a different level, draining areas that were once fluid and leaving domes of sulfur behind. The one shown here is about 4 feet tall. were being stirred. If this were hell, one might imagine that in the antithesis, heaven, this would be hot fudge sauce. There is certainly nothing sweet-looking about the stuff in pits in front us. As we walk the trail, we come to a spectacular overlook of the Artist’s Palette – a very apt name! As you can see, the colors are amazing, and made magical by the escaping wind-blown steam providing an ethereal, shifting dominance in the visible color scheme. Let me show you some overviews as one hikes down to the Palette (click on an image). The large green pond in the first two images is the Champagne Pool, the largest of the hot water springs here, so named because of the bubbles of CO2 that percolate up and float on the surface (show you later). This pool has tilted due to earthquakes, and it now leaks water off to the left, forming an extensive solid silica “river” (show you later). Wow! The whole vista is amazing. The yellowish area leading up to Champagne Pool is quite variable and interesting in its own right. It looks solid, but I would not want to walk out there – some of it seems to be just a crust over water. When you finally get to the Champagne Pool, surprise! It is a green pond – but with an orange perimeter! Awesome! As shown below, the CO2 bubbles bubbling up and bouncing on the green pond surface are everywhere (best seen if you click). The many colors also lead to whimsy, as in the picture to the left. How about “I shot the sheriff”? What is hard to appreciate from these pictures is the movement, the swirling white clouds above this technicolor fantasy. The wind blows the clouds around, and one moment much of the pond is clear and sharp, the next a lot of the view is in soft focus, and the next you can’t see anything but cloud, which you are standing in. This must be what dreams are like, or madness, with reality coming and going. The clouds also greatly affect the color, muting and blurring the tones, then just as quickly snapping them into sharp vividness. I’ve tried to capture an inkling of the color-muting and blurring below. Now realize that you go from that first picture to the last in just a couple seconds, and back, and you’ll get an inkling of the disorienting but mesmerizing effect on the senses. There is more to see, so we leave this misty kaleidoscope and head down the path. It’s a strange world of ponds and rivers of off-green colors. now? Are we smoking something? Is it in the air? Maybe we’ll be orange when we get back? Maybe we’re in a Beatles movie? We press on. Little (and big!) pools and ponds are bubbling like crazy everywhere. Just as it can’t get any more weird, we turn a corner and suddenly the small creek beside us is filled with some form of algae, with some spectacular greens. This stuff can live in this water? It’s very localized, so there must be something unique about this particular environment. seems like an ordinary green lake, even though it is green, with ducks and such having a good time. I test the water in the stream feeding the lake and the steam is only tepid in temperature, so somewhere cool water has been entering. In the distance are a major geothermal power plant (that supplies something like 10% of NZ’s power needs) and a volcano (Maungakakaramea, or Rainbow Mountain), looking somewhat sinister off in the distance. The walk back is a big loop that borders the Primrose Terrace, a solid silica river that grows from the runoff of the Champagne Pool. The Terrace is impressive in its size (we walk along it a loooong way), although it’s not particularly pretty. Up close one can see the details of “arrested flow” as water evaporation deposits silica as “siliceous sinter”. The vapor seen in the last picture is from the Champagne Pool, located just over the crest of the hill. Near the end of our trip and close to where we started, high up over the collapsed-ceiling boiling pits, we encounter some reds that have no obvious source. A little further and we encounter our final amazing sight, a large pond in the most amazing and vibrant yellow/chartreuse you can imagine. It’s dazzling. Your mind thinks this can’t be real, surely this is a trick by Sherwin Williams, but it’s a very big pond and must be real. We’ve reached the end of a pretty amazing visit. I’ll leave you with one last image. We passed this spot at the beginning and end of the walk; steaming water flows over a solid silica “creek” into a rushing fluid stream, a juxtaposition of three distinct phases in this wacky wonderland. There are more nearby geothermal sites hawking their virtues, but it is hard to think they could be better. If you have stayed with me through this very long post, I hope you have been as amazed as we were. We were amazed by the strange beauty, certainly, but we were also confronted with the hellish and powerful reality beneath us. We pretend the earth is solid all the way to China. It is not. We walk on a thin crust, and even that crust is not what we imagine. Just over a mile below your feet, right now, the rock at that depth is too hot to touch. Each mile deeper and the temperature goes up another 75ºF. Further below our feet is a seething, restless hell-monster of magma and pressure, seeking weaknesses in the crust, building strength, and biding time in a very sinister way. How tenuous is our presumed mastery of this planet! This entry was posted in Central North Island, New Zealand, North Island.